Nearly two decades of research in clinic, industry, and educational settings have enabled the authors to present this compact but comprehensive report on the structure of the interview process. Joseph D. Matarazzo and Arthur N. Wiens have put together a concise presentation of research evidence; free from the dogged adherence to personal opinion that plagues most literature on the subject. 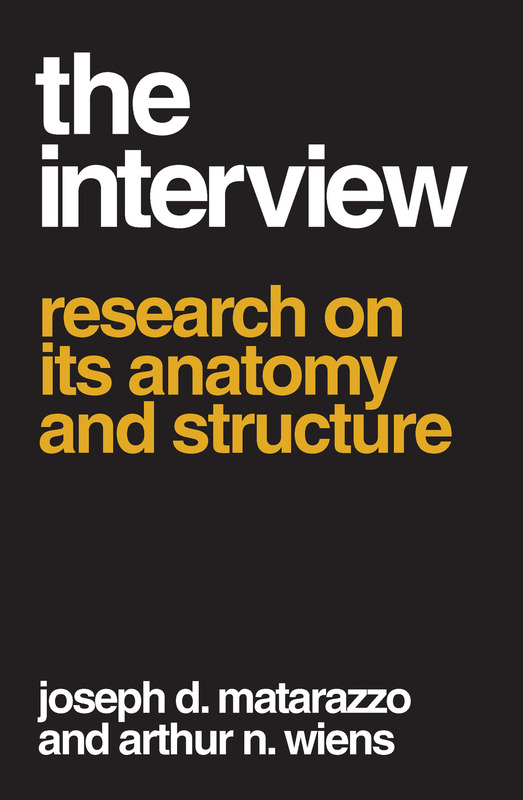 The authors present and discuss basic interview concepts: interviewer and interviewee difference in interview behavior, the stability of such behavior, and conditions, which may modify it (including the first solid evidence, independently cross validated by others, for the effect on the interviewee of specific and common interviewer tactics). The book contains a wealth of data on differences in the interview speech behavior of different types of patients, and between persons in different occupations, different administrative hierarchies, and different professional specialties (for example surgical versus psychiatric nurses). Data from the clinical setting also includes evidence for a new and heretofore unsuspected process variable; i.e., a synchrony in the interruption behavior of the therapist and his patient over many psychotherapy sessions. The undergraduate in the communications fields will find this book an excellent adjunct to any of a number of courses in his special curriculum. Graduate students will find a storehouse of leads for theses and dissertations; while the practitioner and teacher in these fields will find much that is new and important to him in each chapter.